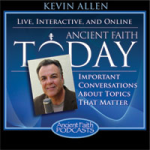 Ancient Faith Today is what Ancient Faith Radio and Orthodox Internet radio have been missing—a live inter-active conversation program. Now that void has been filled! Ancient Faith Today streams live, with call-ins from around the world, twice a month on Sunday nights at 5:00pm Pacific/7:00pm Central/8:00pm Eastern on Ancient Faith Radio Talk. View more information ‘Ancient Faith Today‘ website including a schedule of upcoming events.